When it comes to meal breaks and rest breaks in Florida, are employers required to give these to employees? In other words, is an employee entitled to a meal break and/or a rest break anytime they are at work? What are the limitations with regard to an employee’s rights to breaks? And does an employer have to pay an employee for times when they are on a meal break or a rest break? It is important for employers to know that the only Florida state laws pertaining to meal breaks and rest break concern employees under the age of 18 (who are required to have at least 30 minutes of complete rest for every four hours of continuous work). While there is no Florida state-specific law, there is federal law governing these practices. Let’s take a look at some federal rules in order to understand how they protect employees when it comes to break time on the job. As the U.S. Department of Labor (DOL) explains, there are no federal laws in place that require an employer to give lunch or coffee breaks to employees. However, as the DOL clarifies, if an employer does provide “short breaks,” which are typically defined as those that last anywhere from 5 to 20 minutes, the employer needs to compensate the employee during this time period. In addition, those breaks need to be considered when the employer is calculating whether the employee is due overtime pay. To emphasize, under federal law, breaks under 20 minutes are compensable/must be paid. Why do these periods of time—these “short breaks”—need to be compensated? The DOL explains that these kinds of short rest periods “promote efficiency of the employee,” and thus they are compensated as work time. Does it matter what the employee does during a short break that lasts 20 minutes or less? The DOL emphasizes that the employee’s choice of how to spend a short break (such as having a coffee, using the restroom, or going outside to smoke) does not factor into whether this short break is compensated. A break under 20 minutes is a compensable break. What about longer meal breaks, such as those more than 20 minutes? 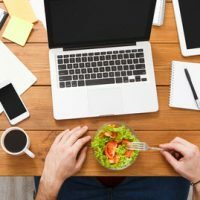 The DOL indicates that lunch and coffee breaks are distinct from “bona fide meal periods.” A bona fide meal period typically lasts at least 30 minutes, and the employer is not required to compensate an employee for this time under federal law. However, it is important to note that if the break – even if it is a meal break – is less than 20 minutes, it must be compensated. Similarly, in order to be a true break, the employee must be completely at rest and relieved from duty. Therefore, and for instance, if an employee takes a lunch break, but continues to work at their desk (or answer phone calls, emails, etc), that total time is compensable. If you have questions about employer requirements when it comes to employee break and meal periods, you should discuss those questions with a Florida wage and hour attorney.